As a follow up to the last podcast, Episode 2, in which we discussed USB Card Readers (the video for which I will link to again and embed below), I wanted to give you all some examples of hubs/readers that you can purchase online from reputable sources. I also wanted to clarify some of the nomenclature that I used when describing the device itself. I actually have this exact reader for my other camera that has an xD card, and though it does have a cord, it doesn't need an external power source and works just like the reader I showed you in the podcast. 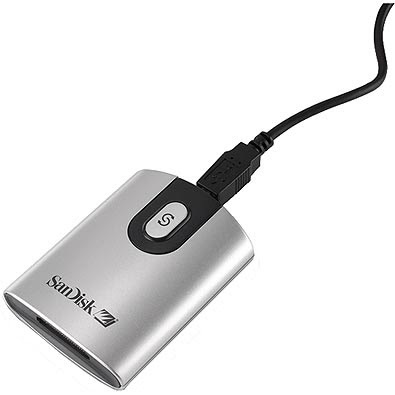 San Disk is a great company for these types of products. So I just had to clarify for all of you that the more correct term for the device that I hope you will all run out and buy is a USB Card Reader, which I mentioned in the video. But c'mon, how can you make a cute title like "Hubba, Hubba, Hubba" out of "USB Card Reader?!" You can't, is the answer. :) I just had to get that off my chest. Oh, and here's the episode again, just in case you missed it! Ok peeps, Happy Friday, and keep those questions and comments coming!! Episode 2: Hubba, Hubba, Hubba! Hello Web-People! Episode 2 is here, and if you take and download digital pictures to your computer, then this one is a must-see! In this episode, I talk about the importance, benefits and inner-workings (without getting too technical!) 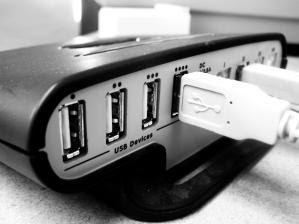 of USB hubs, or card readers. These nifty little devices allow you to -- get this -- download pics from your camera to any computer without using software, or your camera, or even a cable! The next episode is going to be really exciting! I'm going to talk about all of my favorite new gadgets, and even have a few of them to show all of my faithful Geek Girl fans. So, if you have a gadget you'd like me to talk about and feature, send me an email to geek.girl@earthlink.net, or leave a comment in the COMMENT section below. You can even send me a video message to my email, and you just might be featured in my next podcast! I'd love to showcase some of my fans on this podcast. Oh, and don't forget that you can go to iTunes and subscribe to this podcast, all for the low price of FREE! !